Into 'The Untamed': Interview with Sebastian Jones of Stranger Comics – AiPT! We stopped by the Stranger Comics booth and spoke with Sebastian Jones about his upcoming book, The Untamed: The Sinner’s Prayer and the animated TV show he is working on. AiPT! 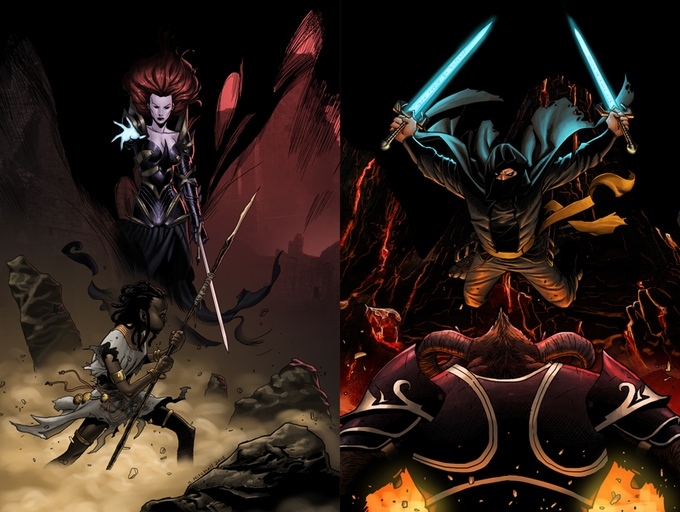 : Can you tell us a little bit about Stranger Comics and The Untamed? Sebastian: Hi, my name is Sebastian Jones. I am the President and founder of Stranger Comics and I am here with The Untamed: The Sinner’s Prayer. It is the story of a bad man who is stuck in purgatory. After ten years the devil comes along and says, ‘I will give you seven days to reap the seven souls that murdered you and your family.’ He says, ‘well sign me up coach, I have nowhere else to be.’ It is set in a dark fantasy universe that I’ve spent 25 years creating. Peter Burgting, who does Harry Potter covers and Lord of the Rings covers in Sweden is the illustrator. Darryl May is the layout artist. I have a great tea. Peter also worked with Mike Mignola on Baltimore. We put 11 years of work into the book. It is finally done and we are making it into an animated television show. Sean “I die in everything” Bean is the lead voice and Amandla Stenberg who played Rue in the Hunger Games. Amandla and I are now writing comics together and hers is called Niobe: She is life. They both come out in November. Niobe’s character is first introduced in The Untamed graphic novel. If you are familiar with the video game, The Last of Us, one of the lead designers of concept art, Hyoung Taek Nam, also did a bunch of pinups and all sorts of bonus extra goodies in the Untamed graphic novel. AiPT! : Can you tell us a little bit more about the animated TV shows. Is that going to be on Disney or…? Sebastian: We are not sure yet. We’ve finished the trailer. The animation team is Film Roman, who do The Simpsons. One of my producers is Lloyd Levin, who made Watchmen, Hellboy, Boogie Nights, The Rocketeer. AiPT! : Wow! You definitely have a lot of people on this project. Sebastian: A lot of buzzwords. Yeah. AiPT! : It looks really awesome. Sebastian: Thank you. You can check out the trailer for the TV show on YouTube, on my Stranger Comics Channel. AiPT! : Can you tell us a little about you? How did you get started in comics? Sebastian: Wow. I got started back in 2008-2009. I had an idea called The Untamed. I shopped it around. People wanted it, people wanted it a bit too much so I decided to protect the vision and start Stranger Comics with a great team of guys. Joshua Kozine came over from Top Cow. My buddy Darryl became my art director and then I met Peter Bergting online and now I am the godfather of his kids. It all just came of happened organically in a very grassroots independent way. I’m excited. AiPT! : It sounds like you are trying to create a supernatural, horror type universe. Sebastian: Yeah, I’ve been creating this world for 25 years. My goal is to create a fantasy universe in comics [like] what Marvel and DC do for the superhero. I would like to do it for the fantasy world with very gritty storytelling. Not your usual, ‘I’m off to save the princess’ stuff. Sometimes the princess will come and save you. That is Niobe. She is a Sin-Isinniel, Sin-Galemren half Wild Elf. She’s pretty badass. If you Google “Manless Stenberg comic,” you will see all sorts of press on the comic. It’s all very exciting. AiPT! : How do we get our hands The Untamed? Sebastian: You can actually pre-order from any comic shop. They come out in November. It comes out November 4th. Ashley A. Woods, a new Marvel artist, did the illustration on Niobe. Any comic shop and if you forget all of that just go to StrangerComics.com or @StrangerComics on any social media. AiPT! : Thank you very much and hope you enjoy the Con!